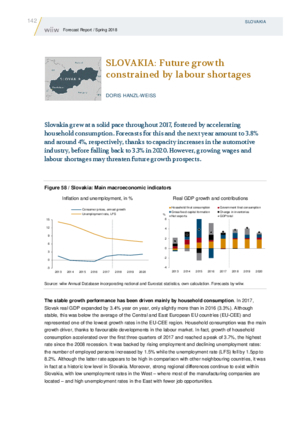 Slovakia grew at a solid pace throughout 2017, fostered by accelerating household consumption. Forecasts for this and the next year amount to 3.8% and around 4%, respectively, thanks to capacity increases in the automotive industry, before falling back to 3.3% in 2020. However, growing wages and labour shortages may threaten future growth prospects.